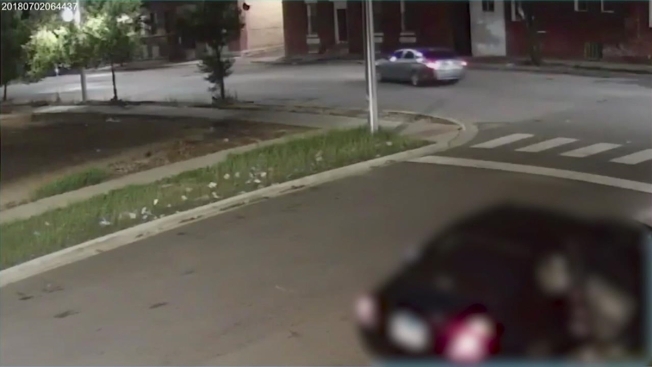 New security video shows the moment a drive-by shooting unfolded in Chicago's East Garfield Park neighborhood, leaving three innocent young girls wounded. Police on Monday were still looking for the gunman responsible. The video shows the shooting as it happened, including the vehicle involved. "Three children all under the age of 15 were caught in this crossfire," said Deputy Chicago Police Chief Al Nagode. Chicago police said the Sunday night shooting was believed to be gang-related. Three others who were walking down the sidewalk nearby were also shot and police said those three were documented gang members. "What we have to do as a city if fight to get these shooters in custody no matter what," said community activist Andrew Holmes. The shooting happened around 9:54 p.m. in the 3400 block of West Walnut Street, according to authorities. Officials said three unknown people, traveling eastbound on Walnut in a black sedan, opened fire out of their vehicle, striking a total of six people. Three of the victims were young girls - ages 5, 14 and 15 - who police said were not the intended targets of the shooting. The girls were in a car driven by their mother at the time the gunman opened fire. The 14-year-old girl was shot in the chest, arm and abdomen and taken to Stroger Hospital in critical condition, according to police. The 5-year-old was hit in the arm and taken to Stroger Hospital in stable condition and the 15-year-old was shot in the thigh and taken in good condition to Presence Saints Mary and Elizabeth Medical Center, officials said. The three other victims were standing outside when they were shot. A 17-year-old boy was shot in the foot and a 26-year-old man in the thigh, according to police, who said they were both taken to Stroger Hospital in good condition. A 20-year-old woman was shot in the chest and arm and taken to Mount Sinai Medical Center in serious condition, officials said. Authorities said the shooters' vehicle was last seen traveling northbound on North Homan Avenue. Police said they have been trying to combat an increase in gang violence in the neighborhood. "We have historical gang conflicts in this area," Nagode said at a news conference. "We’ve been devoting a tremendous amount of resources this weekend, specifically in an attempt to prevent this." No one is in custody as the investigation remained ongoing. Anyone with information was asked to contact Chicago police.